While the breathless excitement of an Indian city lies in the tangled web of its streets, a refuge is vital if you are to be able to appreciate them. It is no accident that the frantic bustle of Kolkata’s 15-million people revolves around the immense expanses of The Maidan. Since colonial times this area has been the lungs of Calcutta (as the city was known until 2000) and while it is still a venue for horse-racing and polo, it is now the perennial meeting place for power-walkers, kite-flyers, Tai Kwando teams, meditation classes, goatherds…and the cricket matches without which any recreation area in India would be incomplete. Lacking the ancient history of Delhi, the Bengali capital was virtually an invention of the colonial government. The Maidan itself was originally cleared to offer an uninterrupted line of cannon-fire from the battlements of Fort William, which was so clearly impregnable that it was never attacked. Kolkata is famed as the cultural centre of India and for the friendliness of its inhabitants, but the Bengalis nevertheless complain that their worldwide reputation for poverty is the product of a biased Western media. Kolkata’s beggars and its ramshackle hodgepodge of shantytowns are no worse than the bustees of Delhi or Bombay: if Kolkata has such a ‘wealth of slums’, the locals say, then why did Hollywood have to build one when they filmed ‘City of Joy’ here? Anybody who thinks that Kolkata’s infamous hand-drawn rickshaws are now only for the tourists should take a look at the traffic passing over the Howrah Bridge where entire herds of ‘human horses’ shuttle commuters, travellers, salesmen, schoolchildren, wicker-baskets full of chickens and bright bundles of floral offerings. This is the busiest bridge in the world, supporting a daily stream of 100,000 vehicles and well over a million pedestrians. 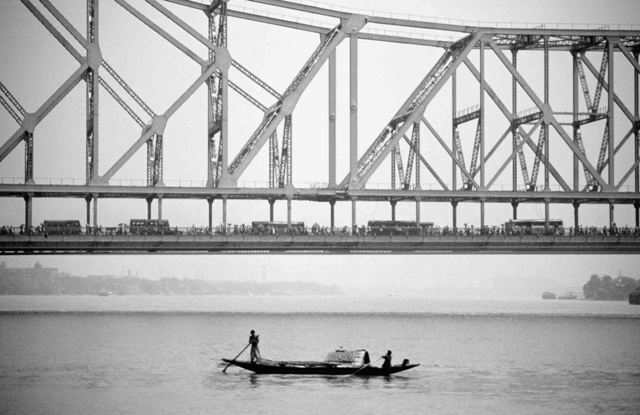 Swooping in a single 450-metre span, high above the washerwomen and smouldering cremation fires of the Hooghly River ghats, it is about the same size as the Sydney Harbour Bridge…but the density of traffic means that during rush hour it can take 45 minutes to drive from one end to the other. The Bengali’s say that all human life – and probably most other forms – will sooner or later pass over their bridge. If it were possible to stand still in this swirling sea of humanity, the Howrah Bridge could be described as one of the greatest shows on earth. White-shirted clerks heading for the great bureaucratic bastion of the Writer’s Building bump into disoriented, wide-eyed villagers from the Bihar hills; Tibetan monks walk beside naked Digambara holy-men; an anti-war demonstration by the communist party overtakes a troop of nautch dancing girls with porters carrying their bundled costumes; chai-vendors carrying huge teapots clash with still more porters, weaving great rolls of carpet through the crowd.